Hi everyone! It’s that time again. Time for another Mom Fabulous Holiday Gift Guide. Be sure to check out the other gift guides which include ideas for the hostess, the man in your life, the fashion minded mom and those adorable kids. 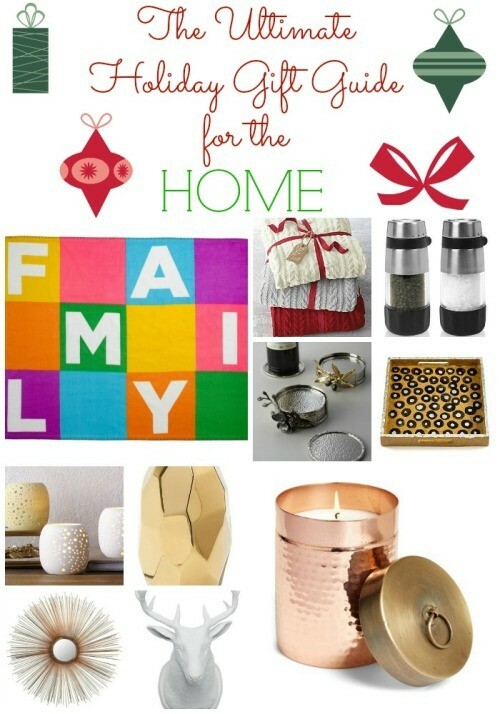 From cozy blankets and great smelling candles to gold accents and something for the kitchen, today’s gift guide is all about the home. 1. Exclusive Novogratz-Designed “Family” Blanket – One of my favorite design teams, The Novogratz Family, has partnered with Old Navy to create an exclusive design blanket that says “Family”. It’s soft, it’s plush, it features gorgeous colors and it’s a gift that will add a pop of color and fun to someone’s home. I have one and it’s become one of our favorite blankets to cuddle up with. Plus, it’s only $15! 2. Cable Chenille Throw – If you want to give someone a gift that oozes luxury, the Cable Chenille Throw from J. Jill is perfect. I can’t even put into words how soft and amazing it feels. What I also love about it is it comes tied with a red bow and a beautiful J. Jill gift tag. Not to mention the gorgeous colors: red, platinum and ivory. You could create an amazing gift basket with this throw. Just place it in a basket with a bottle of wine and a wine opener, and you have one fabulous gift. 3. OXO Salt and Pepper Shakers, Grinder Set – There’s nothing like freshly ground salt and pepper to season your plate. If you have a chic chef to buy for this Holiday season, the OXO Salt and Pepper Shakers Grinder Set will bring fresh flavors to their table. Not only are they extremely useful, but the stainless steel accents help them look great sitting out on your counter or dining room table. 4. Black Orchid & Olive Branch Coaster Sets – Give a gift that is pretty and practical. These Black Orchid & Olive Branch Coaster Sets are made of nickel-plated and black nickel-plated metal. The holder features either a beautiful gold olive branch or a black orchid. 5. Heart of Haiti Gold Tray – There is so much you can do with a tray in your home and I use them quite a bit. You can use them to corral remotes on your ottoman, to display special items on your coffee table or even use them on your dining room table. This gold Heart of Haiti tray adds a touch of nature. It’s made out of wood and painted a beautiful gold color with a fun black print. 6. Pierced Porcelain Tealights – I love using tea lights and finding beautiful holders for them. These Pierced Porcelain Tealight holders from West Elm are perforated with a delicate design inspired by the night sky that filters light in the loveliest way. Imagine how perfect this will look in someone’s home, all lit up and showing off. 7. Nate Berkus Gold Facet Vase – This vase from the Nate Berkus collection at Target is not only stunning, but it’s affordable with a $14.99 price tag. It’s the perfect piece for a bedside, sofa or entry table. It really makes a statement and when styled with coordinating pieces, it can really wow your guests. 8. Sunburst Mirror – This Sunburst Mirror available at Home Depot is crafted with iron and glass. The delicate wire spokes radiating from a central disc will glow night and day to reflect your room’s lighting. This is a classic accessory that really stands out in someone’s home. 9. Deer Head Wall Hook – For the person who likes a touch of unique glam, this Deer Head Wall Hook is definitely unique, plus it’s animal friendly. These hooks can be used in an office, studio or room. 10. ‘Homestead’ Hammered Canister Candle – Give a gift of a candle that not only smells amazing, but looks amazing as well. A hammered coppertone canister with a burnished brasstone lid lends eclectic vintage allure to a fragrant, hand-poured wax candle. This will make a great accent piece for any room of the house.